Everybody needs tape, paperclips and writing tools. The Office Box with its integrated tape dispenser and drawer makes it easy for you to gather all your office tools as accessibly as possible. Nomess acrylic line offers a variety of functions, sizse and shapes - an answer to all what your work space organising needs. This small portable office box is ideal for architects, office workers or designers of any sort. 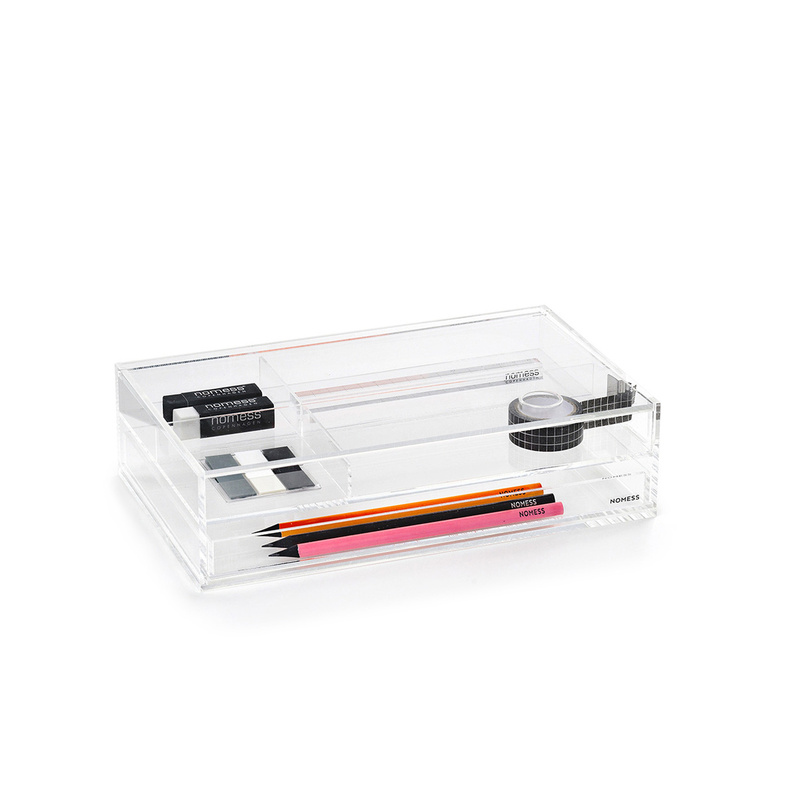 Now you can store away all of your pens, pencils and stationery in a neat and tidy fashion. Everything will be perfectly in sight while being perfectly ranged. 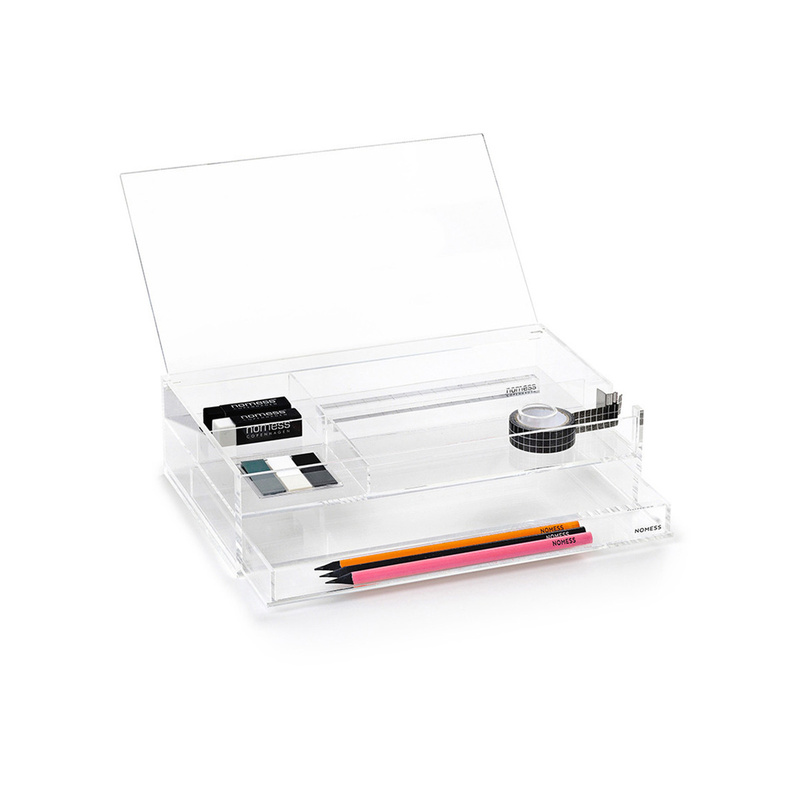 This functional office box is made from clear acrylic plastic that makes it easy to locate what's inside. It is equipped with a pull-out drawer and a lift-up lid, so that all your belongings are safely protected when not in use and easily accessible as soon as they are needed. The compact size of this clever storage solution makes it easy to place it anywhere in your office or work desk, even when room is limited and it is essential that everything stays as tidy as possibile. Acrylic plastic is a sturdy and durable material. The super simple shape of this handy office organiser suits all kinds of interiors, from modern to classic, from traditional to contemporary. Its sleek yet understated design will be a favourite of many. You can also use the Office box on your bedside table or in your bathroom, or place it on a shelf as a miniature display cabinet for your travel souvenirs or favourite objects. This item belongs to the workspace collection by Nomess Copenhagen, a Danish design brand whose mission is making everyday life easier and tidier. Nomess Copenhagen was founded in 2007 by Suzanne Potts, due to her own demand for organising, simplicity and aesthetic indulgence. All products are designed for the single purpose of making everyday life easier. For Nomess the functionality in organising objects can't stand alone - it simply needs aesthetics to function.